An alcohol artist’s dream come true. 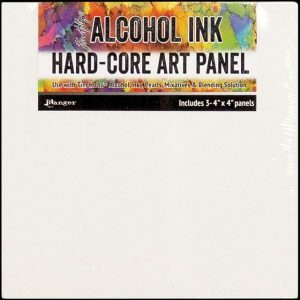 These rigid art panels are coated (on both sides) with a special, non-porous vinyl. There is a slight, fine texture, making it different from smooth surface of Yupo. 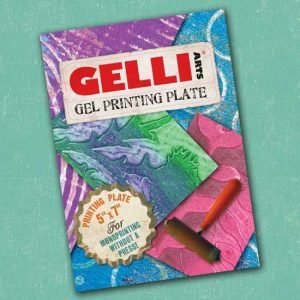 Welcome to the world of Mono Printing with Gelli Arts! They love gelatin printing so they developed a better way to do it! This Gel Printing Plate looks and feels like gelatin, but is durable, reusable and stores at room temperature. It's easy to clean and always ready for printing. Monoprinting on a Gelli plate is simple and fun. The gratification is immediate, and the prints are too cool! Imagine your own designs used in your jewelry, polymer clay and scrapbooking projects. There are lots of videos to inspire you. 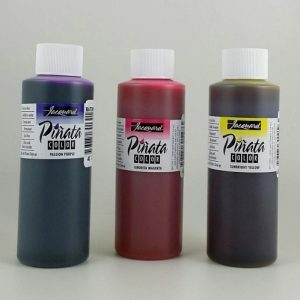 Use with this brayer and these paints for starters. 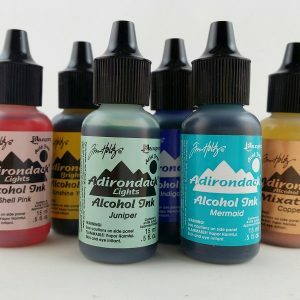 Adirondack Alcohol Inks by Ranger/Tim Holtz Valencia, Limeade, Turquoise Acid-free, fast drying transparent coordinating Earthtones, Lights and Brights dye inks specially formulated to create a colorful, polished stone effect. Use on glossy paper, dominoes, metal, shrink plastic, glass, and other slick surfaces. Available in 18 exciting 3-color palettes. 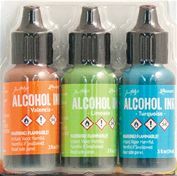 Key West Adirondack Alcohol Ink Set by Ranger /Tim Holtz Dandelion, Coral and Pistachio Acid-free, fast drying transparent coordinating Earthtones, Lights and Brights dye inks specially formulated to create a colorful, polished stone effect. Use on glossy paper, dominoes, metal, shrink plastic, glass, and other slick surfaces. Available in 18 exciting 3-color palettes. 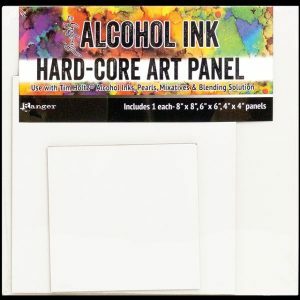 Pinata Alcohol Ink by Jacquard 4oz size. 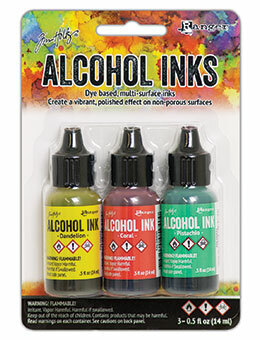 Huge savings when you purchase the large 4oz size of Pinata Alcohol Inks. Buying the equivalent in the small .5 oz bottles would cost over $34.00! Newest Colours Brass, Copper and Pearl are only available in 4oz Claro Extender and Clean Up Solution available in the 4oz size now too. Click the description tab at the bottom of the page for more in-depth info. 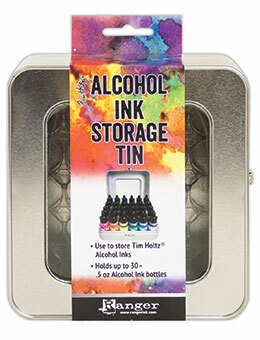 Alcohol Ink Storage Tin (holds 30 .5 oz Bottles) Perfect for storing your .5 oz alcohol Ink bottles (or similar). Small base with deep lid so that you can view the colors when open without removing them. There is a plastic insert that keeps the bottles secure. Perfect for taking to classes and workshops. Fits 30 bottles. 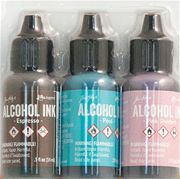 Retro Cafe Adirondack Alcohol Ink Set by Ranger /Tim Holtz Pool, Pink Sherbet, Espresso Acid-free, fast drying transparent coordinating Earthtones, Lights and Brights dye inks specially formulated to create a colorful, polished stone effect. Use on glossy paper, dominoes, metal, shrink plastic, glass, and other slick surfaces. Available in 18 exciting 3-color palettes.